These pillows are so incredibly comfy. 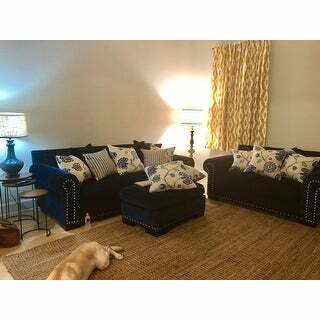 Great quality and the perfect addition as throw pillows to my blue themed couches. They really do function as throw pillows but look great as decor. My family loves lounging around on them, great nap pillows. Complete the cozy feel of your living space with the comfortable touch of this Rizzy Home throw pillow. The striped pattern and natural color lend an appealing accent to your sofa. A nice, full pillow. The front side is a muted ticking pattern, on a canvas-type material. A rougher texture, but I like it. The back of the pillow is softer, and is the greyish color you see on the front. This is a great quality pillow. It might be a little more off-white than it appears in on-line, but a very nice color. I have washed the cover twice already and this pillow is no worse for the wear. (muddy dogs) I would definitely recommend. This is a Beautiful pillow, well made and exactly as described. I bought this pillow because I'm building a banquet in my kitchen and want a little comfort when i drink my morning coffee! The zipper looks sturdy and should allow me to easily remove the cover to wash it. Beautiful pillow to contrast our baby pillows and beige sectional. Great material for the price. I would recommend this product to others looking to add some pop to their family/living rooms! Casual but pretty to fit with our farmhouse decor! Cute, high quality pillows but they're quite stiff. Not the softest thing to lie your head on but aesthetically they are perfect. We have them on our family room sofa which has a farmhouse style. Nice pillows overall. Matches description. I bought this for my sister for Christmas and she loved it. She bought new couches and asked for throw pillows. 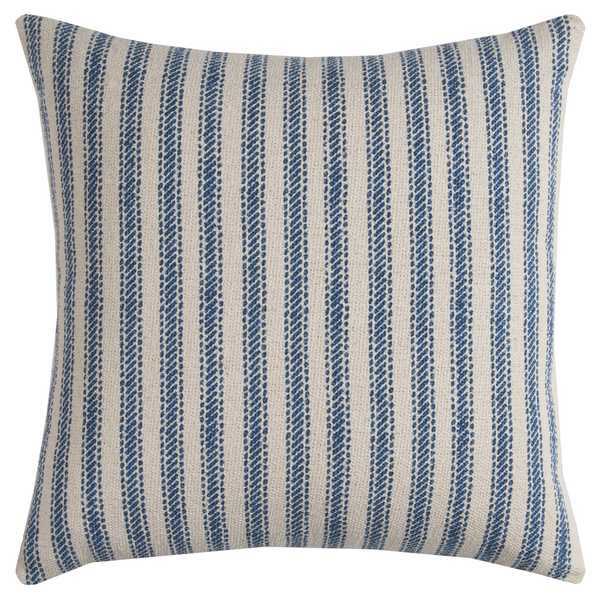 Really nice pillows that go well with my navy den. I love this pillow! The blue is a nice navy and will blend well with anu blues. 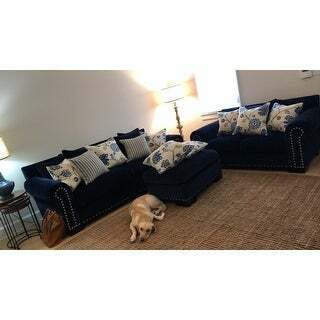 I have it on m y navy couch and it really stands out. seems to be well made. heavy. Pillow is beautiful and extremely well made! Typically a pillow has large costs a lot more. I already have two and I love them. "Is the blue more of a navy or royal blue? Hard to tell online." Closer to teal blue actually. Cream background. With zipper so the cover can be washed. Very nice. Well made. I'd say navy blue. As in a ticking pattern, the blue stripe is interrupted with off-white threads. "Does this pillow have a zippered cover?" "Can this pillow be left outdoors on deck chairs?" This pillow is designed for indoor or outdoor use. I would think only on a covered deck. Or else I would say no.